I hope you've had a chance to check out pinkcherrymama's newest addition to her vintage tag collection! These fabulous black cats are just the thing for Halloween celebrations! I didn't order in time for the holiday, but they will make the perfect addition to my 2009 Halloween scrapbook pages when I finally sit down to do them! 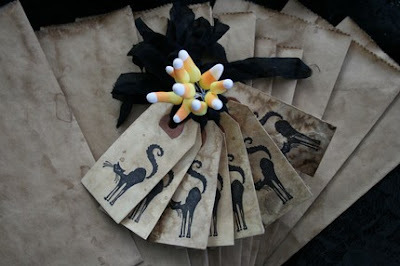 Very cute, especially like the candy corn. there is a raffle in my blog, maybe you wanna take part in it!!! I am a Spanish fashion designer, now living in NY, selling my stuff in Manhattan! I hope you like it! These are so cute for Halloween!! Wow, these are a treat! Can't wait to see what you do with them.